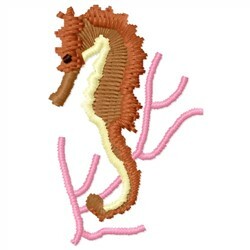 Seahorses are one of the most interesting aquatic animals. This little guy would be perfect in an underwater themed bedroom on blankets, pillows, and wall hangings. Embroidery Stitches is happy to present Sea Horse machine embroidery design which has 2244 stitches and is [25.65 mm x 40.39 mm] large. If you would like to view more embroidery patterns please search on our embroidery designs page.